Muttu Irulayi Ammaiyar of Manamadurai is a exceptionally dedicated adiyar of Lord Senthil Andavar and Goddess Mari Amman. She met her guru, a Brahmin employed as a cook in his native Ramanathapuram, twenty years ago at Tiruchendur. With sheer determination, her guru would collect donations so he could cook and serve annadanam to hundreds of poor devotees at Tiruchendur during Kanda Sasti. Along with a growing band of devotees who serve hundreds of devotees daily tiffin, lunch, and dinner, Muttu Irulayi Ammaiyar and her followers, who are all from humble backgrounds, serve the poorest and humblest of Lord Senthil Andavar's devotees annually at Tiruchendur. Yet despite months of fund-raising annually, they find it more and more difficult to find the funds needed to purchase rice, vegetables, oil, and other provisions needed to serve so many devotees. Murugan Bhakti encourages devotees to feed the Lord's poor devotees during Kanda Sasti (many of whom only take one meal per day during Sashti). Rupees 75/- (~US$ 1.25) only covers one sumptuous vegetarian meal. For US$60 only, you can feed 50 devotees. 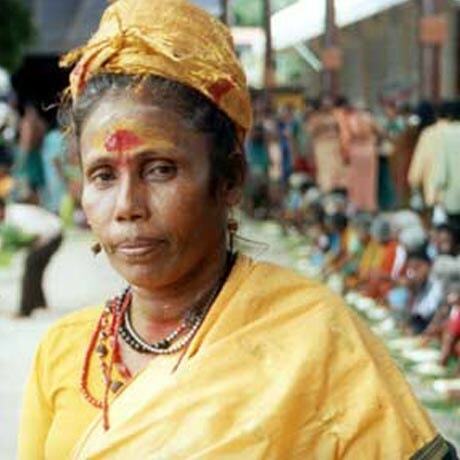 Muttu Irulayi Ammaiyar and her devotees serve unpaid as bhaktars, so your donation brings the maximum value for the minimum cost. Note: Annadanam at Tiruchendur can be arranged only during Kanda Sasti.